Kizhi is an island near the geometrical center of the Lake Onega in the Republic of Karelia (Medvezhyegorsky District), Russia. It is elongated from north to south and is about 6 km long, 1 km wide and is about 68 km away from the capital of Karelia, Petrozavodsk. Settlements and churches on the island were known from at least the 15th century. The population was rural, but was forced by the government to assist development of the ore mining and iron plants in the area that resulted in a major Kizhi Uprising in 1769–1771. Most villages had disappeared from the island by 1950s and now only a small rural settlement remains. In the 18th century, two major churches and a bell tower were built on the island, which are now known as Kizhi Pogost. In 1950s, dozens of historical wooden buildings were moved to the island from various parts of Karelia for preservation purposes. Nowadays, the entire island and the nearby area form a national open-air museum with more than 80 historical wooden structures. 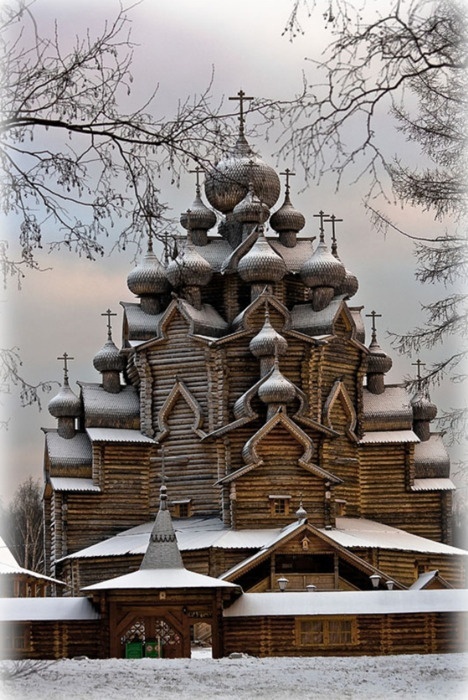 The most famous is the Kizhi Pogost, which is a UNESCO World Heritage site.